GOES-R IFR Probability fields continue to be created using legacy GOES (GOES-13 and GOES-15) data. This is slated to continue through late 2017. 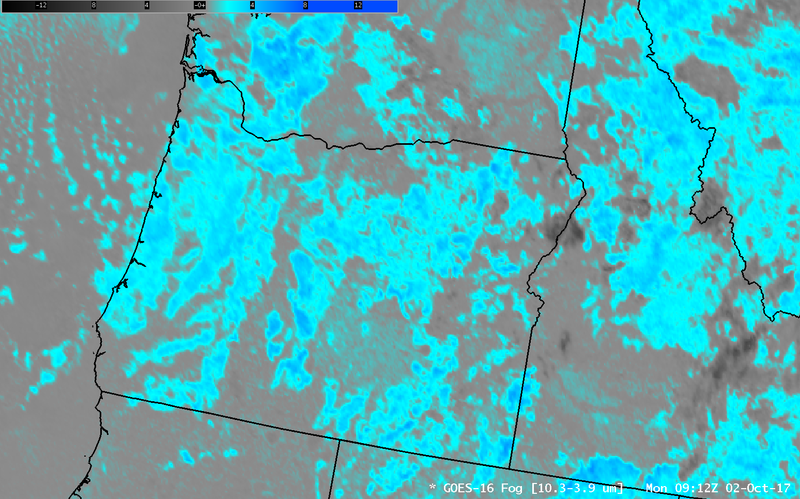 The toggle above, over Oregon, hints at how the change in resolution in GOES-16, even far from the sub-satellite point, will likely improve GOES-R IFR Probability performance in regions where topography can constrain low clouds and fog. 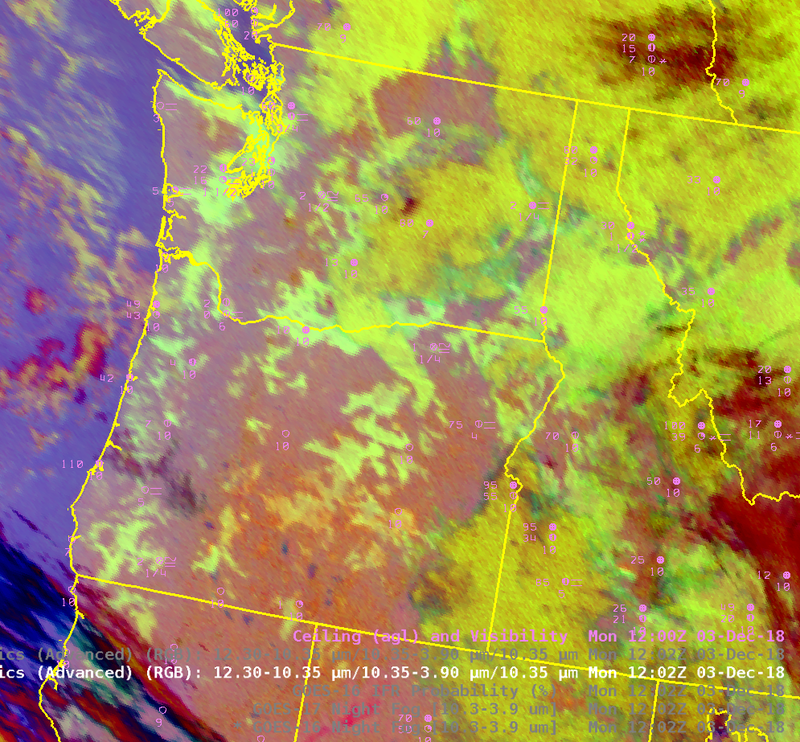 The GOES-16 Brightness Temperature Difference field, above, is color enhanced so that positive values (that is, where the brightness temperature at 10.3 µm is warmer than the 3.9 µm brightness temperature, which regions indicate cloud tops composed of water droplets, i.e., stratus) are whitish — and the data shows stratus/fog along the Oregon Coast, with fingers of fog advancing up small valleys. 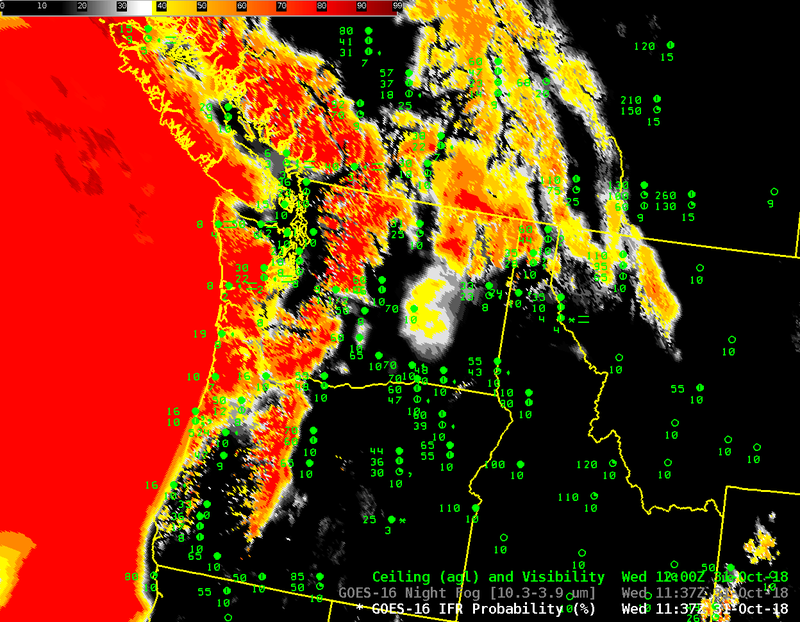 The image below shows the GOES-R IFR Probability field for the same time (Click here for a toggle). 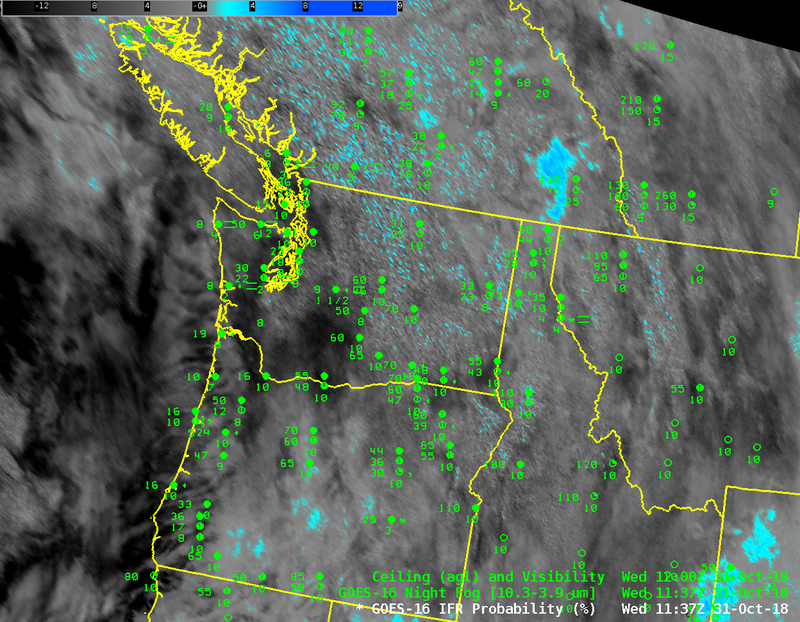 GOES-R IFR Probability fields show strong probabilities where the Brightness Temperature Difference field above is indicating low clouds. This is not surprising as the morning fog on this date was not overlain by higher clouds. 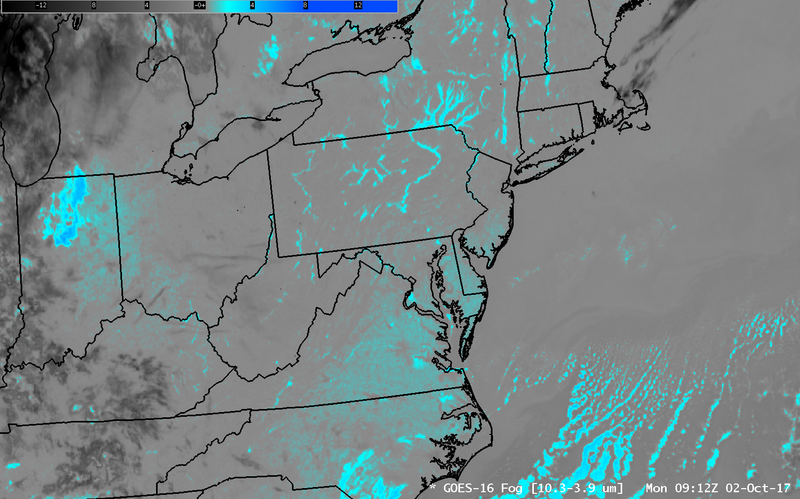 However, the resolution inherent in the legacy GOES (inferior resolution compared to GOES-16), shows up plainly as a blocky field. When GOES-R IFR Probability fields are computed using GOES-16 data, the IFR Probability field resolution will match the GOES-16 resolution. 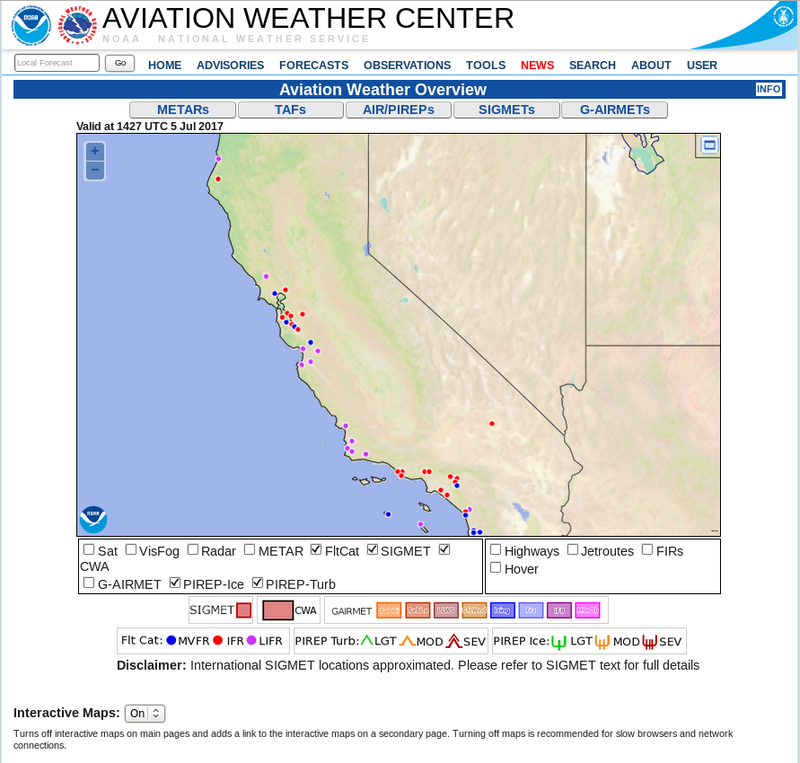 (Click here for a aviationweather.gov observation of IFR / Low IFR conditions on the morning of 5 July). A similar set of figures for California at the same time is below. 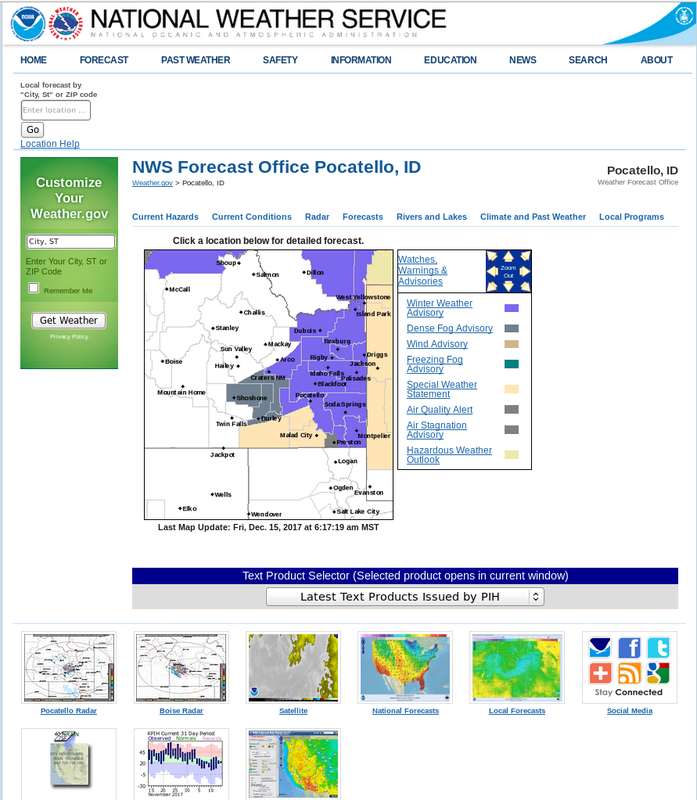 The toggle is here, and the aviationweather.gov screen capture is here. This entry was posted in California, GOES-16, Pacific Northwest on July 5, 2017 by Scott Lindstrom. 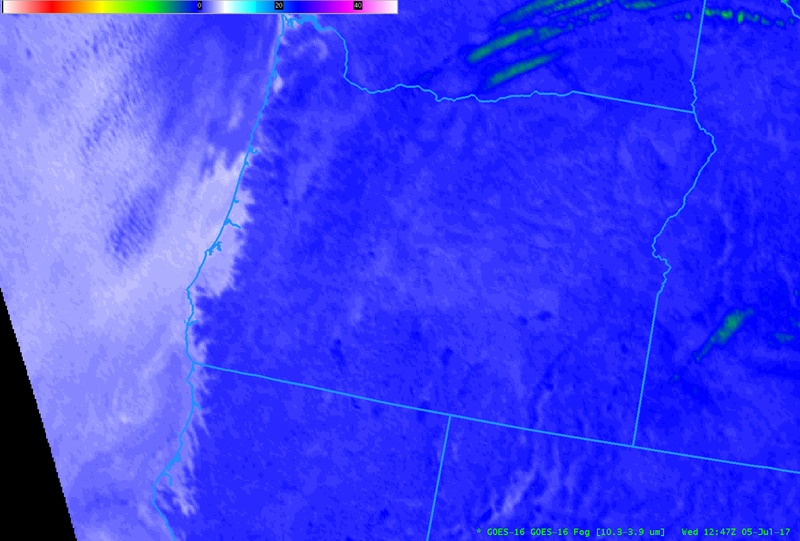 Dense Fog developed in the Willamette Valley of western Oregon during the early morning hours of 21 December 2016. 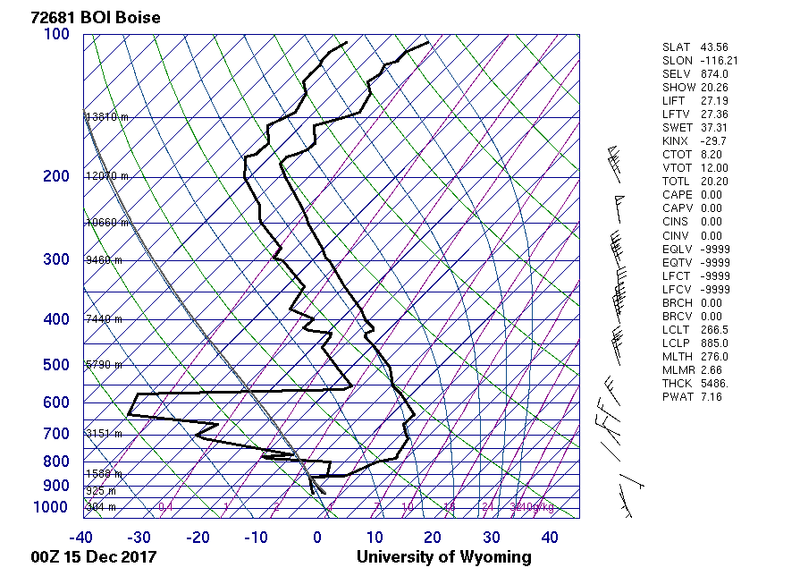 How did GOES-R IFR Probability fields and GOES-15 Brightness Temperature Difference (3.9 µm – 10.7 µm) Fields diagnose this event that led to the issuance of Dense Fog Advisories? The hourly GOES-R IFR Probability animation, above, shows increasing probabilities in the Willamette Valley, starting around Eugene (KEUG) and spreading northward until high probabilities cover the valley by 1400 UTC. 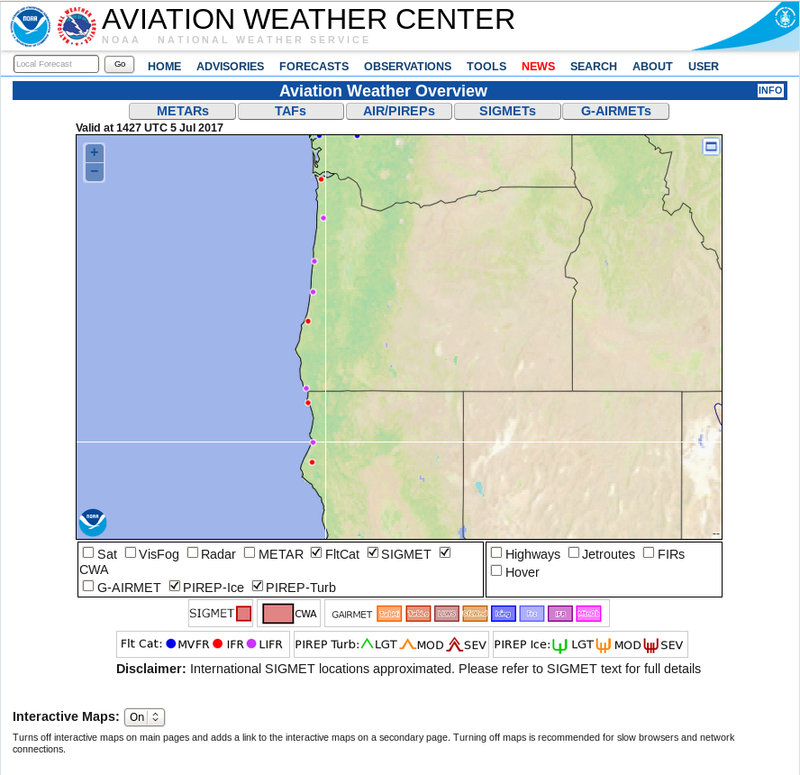 IFR Conditions are first reported near Eugene, then through the entire valley by 1400 UTC. 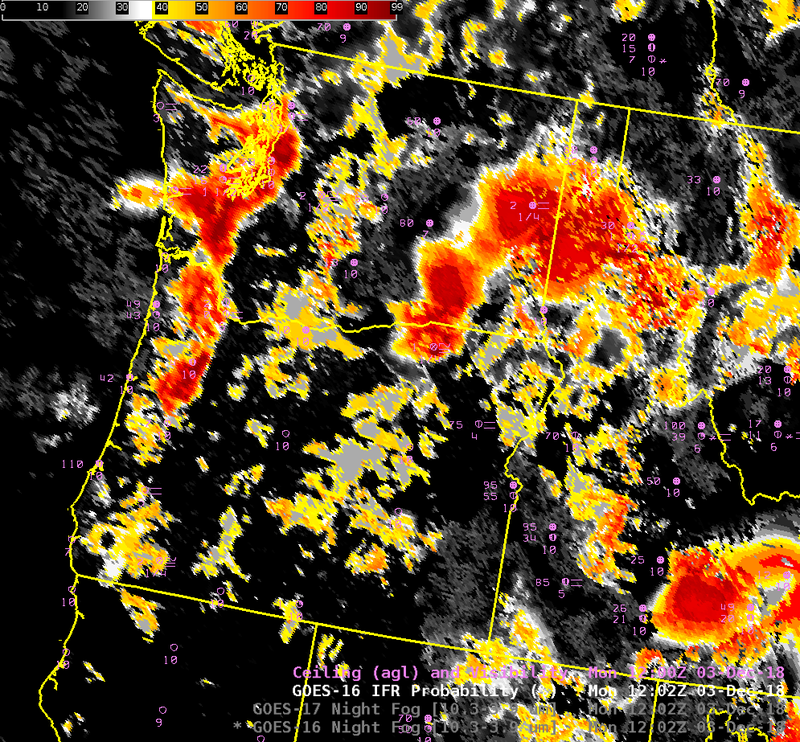 Widespread high IFR Probability values are not present elsewhere over Oregon (although they do exist over Washington State, where IFR conditions were also observed). The Brightness Temperature Difference field (3.9 µm – 10.7 µm), below, shows a different distribution. 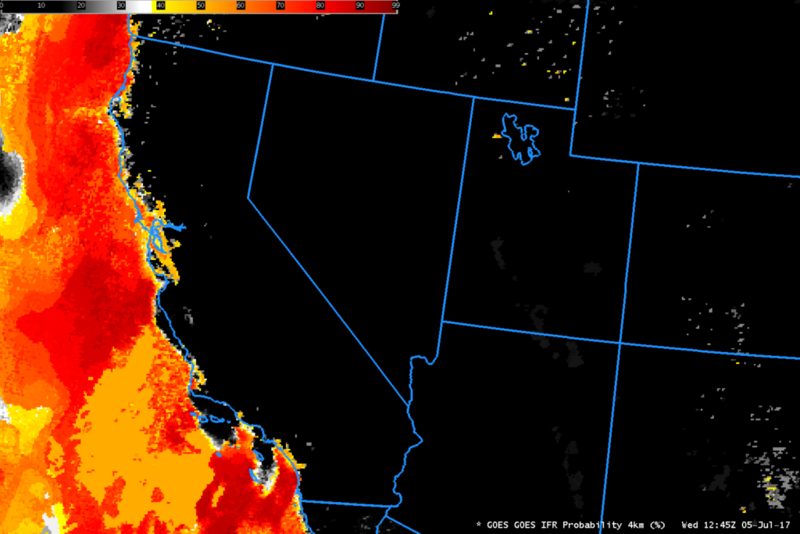 Early in the animation a strong signal is apparent over much of northern Oregon, and also over the Pacific Ocean. Rapid Refresh output on low-level saturation is used in the GOES-R IFR probability algorithm to screen out regions where stratus that is detected by the satellite likely is not extending down to the surface — over the ocean, for example (coastal sites do not show IFR Conditions), or over much of eastern Oregon/Washington. 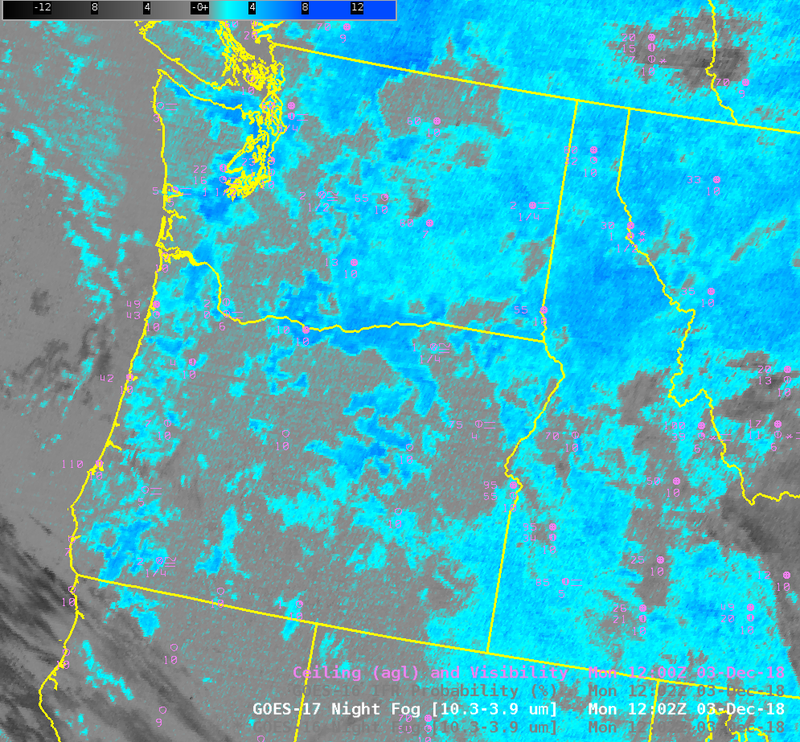 Brightness Temperature Difference fields do eventually highlight the presence of fog in the Willamette Valley, but considerable regions outside the valley have a strong return and no indication of IFR conditions. GOES-R IFR Probability fields will frequently (and correctly) screen out regions of strong returns in the Brightness Temperature Difference fields that do not correspond to surface obscuration of visibility and/or low ceilings. 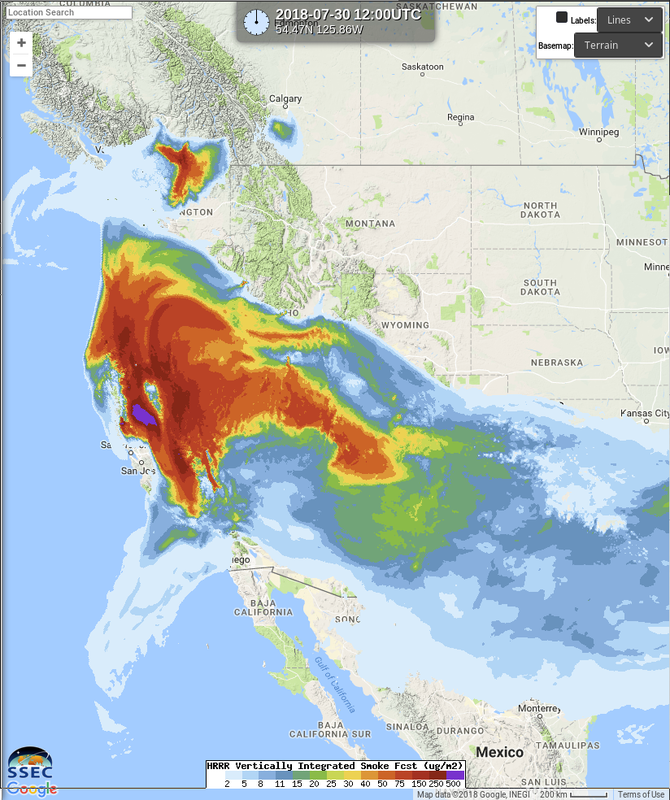 It is possible to alter the Brightness Temperature Difference Colormap, as below (animation courtesy Mike Stavish, SOO at Medford) to better highlight regions of fog in this case. 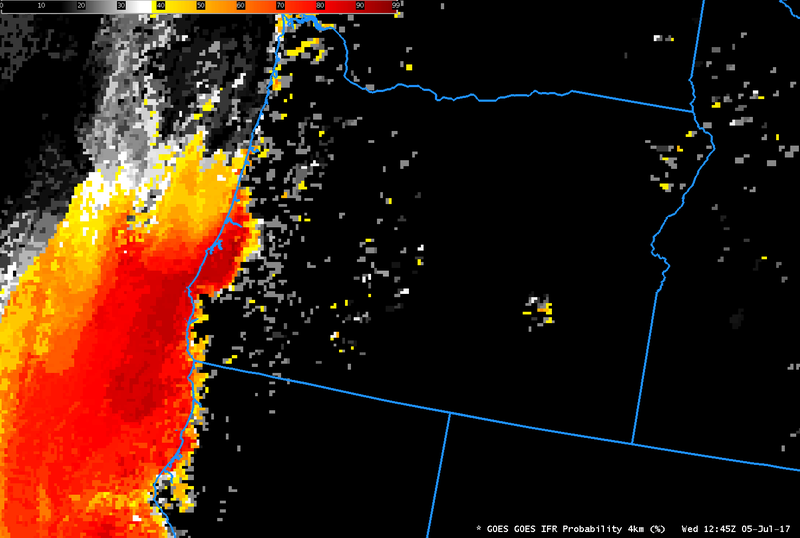 Note in this enhancement the cirrus clouds appear white, rather than dark, as well. 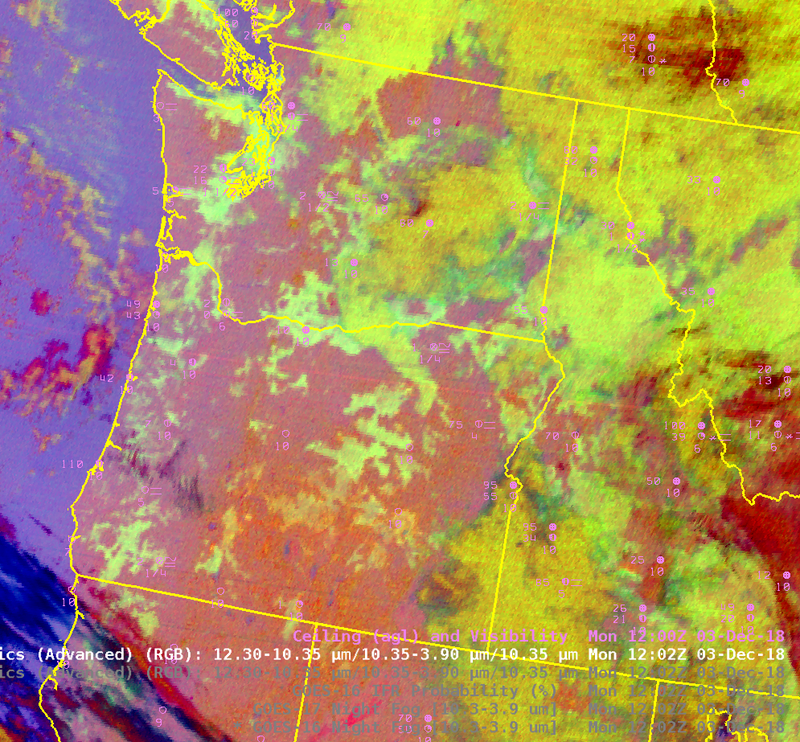 The toggle below shows two color enhancements at 1200 UTC: the default version with many orange pixels, and an altered version that shows fewer pixels, mostly in regions where fog is present. 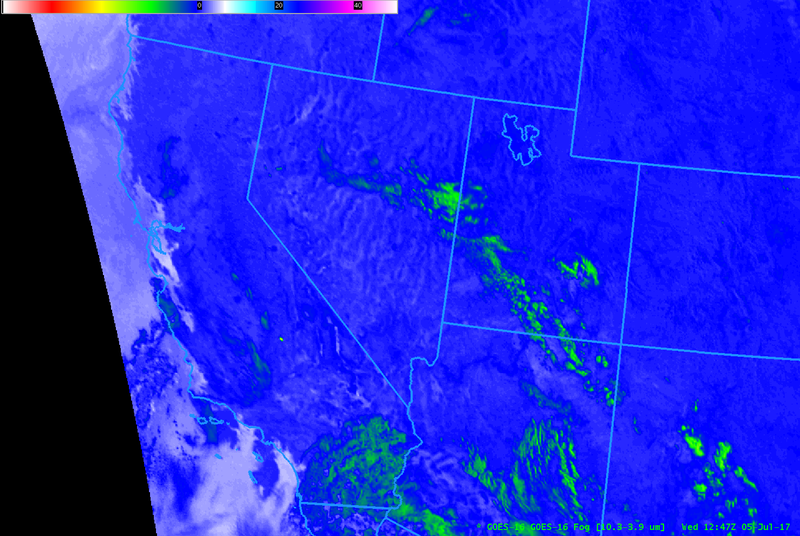 A similar toggle for 0400 UTC is here. 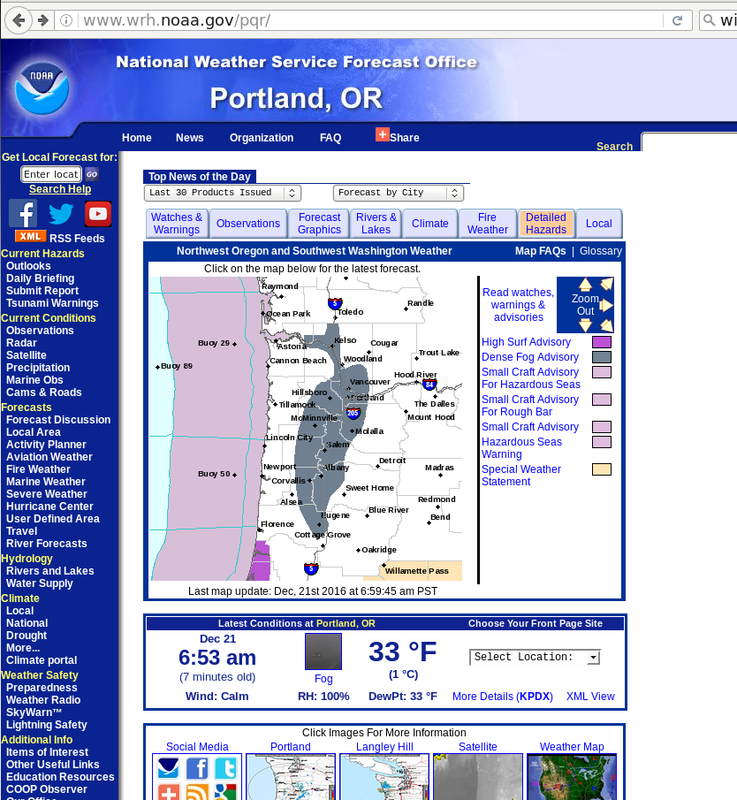 This entry was posted in Pacific Northwest on December 21, 2016 by Scott Lindstrom.